The month of November is Native American Heritage Month. A recent editorial by Kevin Gover, director of the Smithsonian Institution's National Museum of the American Indian, suggests that "the vast majority of Americans have a limited -- and often mistaken -- understanding of Native American history." That so? 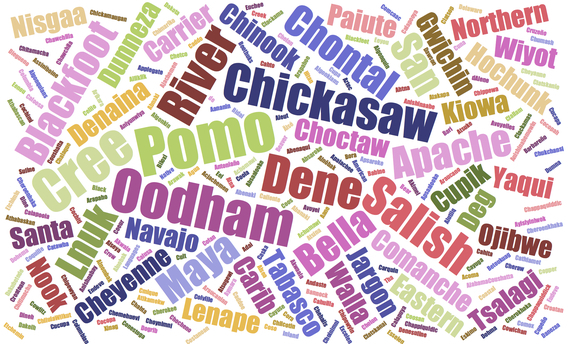 Native American languages can offer deep insights into our nation's history. Here's seven things to know about Native American languages. 1. This time of year, there's lots of talk about the Pilgrims and the Indians and their celebration of a harvest feast together back in the 17th century. Well, here's some history through language. Those were the Wampanoag Indians, indigenous to southeastern Massachusetts and Rhode Island. As one consequence of this colonial contact, the Wampanoag language, part of the Algonquian language family, gradually ceased to be spoken. But through the efforts of the Wôpanâak Language Reclamation Project, founded by Jessie Little Doe Baird, community members have given voice to their language once again. Looking for a great movie to fit in between football games after that big turkey dinner? This amazing story of language lost and reclaimed is told in the documentary, We Still Live Here: Âs Nutayuneân. 2. Maps! United States geography shows that many names for rivers, mountains and towns originate from the languages spoken by the Native American tribes indigenous to particular areas. For example, Texas, where I live, is a state name coming originally from the Caddo word for friend or ally (which then got borrowed into Spanish), according to William Bright's Native American Placenames of the United States. Given that Native Americans predate English speakers on this continent, this should be no surprise. 3. It's stunning how many different language families are indigenous to our continent, more than fifty! Sure, North America's pretty big, but for comparison sake, Europe has only three main language families. Game over, Europe. 4. Native American languages played a key role in World War I and World War II. Native Americans in the military used their languages in carrying out missions, including by transforming ordinary words of their language to encode military vocabulary. These soldiers became known as 'code talkers,' coming in largest numbers from the Navajo Nation, and representing tribal citizens who spoke least 16 distinct indigenous languages, including Cheyenne, Osage, Comanche and Choctaw. There is a direct relationship between the introduction of white education and the decline of the Sauk language. Prior to the Sac and Fox Manual Labor Boarding School there was no institution among Sauk people in which a person was removed from intimate family, clan, and tribal relationships in order to learn. [italics mine] Compulsory white education for Sauk children began in 1871 with 24 students at the mission school... Within a span of 60 years Sauk went from being spoken by almost every tribal member to being spoken mostly by older people amongst themselves. Not a single tribal member born in the 1930s or beyond successfully passed on fluency to their children. 6. Two states have recognized their indigenous languages with official status. Alaska recently became the second state to do so, with 20 languages indigenous to the state. Hawaii started this trend. The Hawaiian language has since blossomed, with a resurgence of young Hawaiian speakers and immersion schools and college degrees -- all in the language. 7. In 1990, the Congress passed the Native American Languages Act, declaring it U.S. policy to "preserve, protect, and promote the rights and freedom of Native Americans to use, practice, and develop Native American languages," including in classrooms, to ensure the survival of these languages. The Act is up for renewal in Congress right now. This may be a lot of history, but Native Americans aren't history. Neither are Native languages. It's November. Celebrate Native American Heritage Month. Celebrate Native American languages! Want to be in the loop for the latest on Native American language and revitalization? Follow the Native American Languages Lab on Twitter.